Fees Free Entry; donations to Glamis Adventure Playground. Cornucopia Theatre Company presents THE TEMPEST, its fourth site-specific Shakespeare production using physical theatre, original music and circus arts in this magical story of the Native American Caliban and Norse Prospero, who commands the gravity defying Ariel. 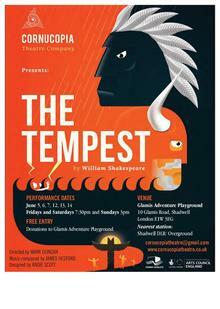 ‘The Tempest’ builds on Cornucopia’s previous productions at Glamis Adventure Playground; ‘Macbeth’ (2011), ‘Romeo and Juliet’ (2012) and ‘A Midsummer Night’s Dream’ (2013).